Not long after I wrote my Painter 6 review, Metacreations sold off all of its graphics products to other companies to focus on its web-centric rich media solutions. I was more than a bit disheartened to see that Painter was one of a few packages acquired by Corel, figuring that Painter would be either driven into mediocrity or forgotten altogether in the shuffle of graphics solutions for (ahem) professional office users. Thankfully, I was wrong. Corel spun off a division called Procreate to handle the development of Painter and some other graphics applications. Painter 7, although not a giant step ahead, is a worthy upgrade for this truly incredible digital painting tool. Painter has the enviable distinction of lacking real competition for what it does best: mimicking and utilizing natural media looks and techniques in a digital environment. While there is a bit of overlap with Adobe Photoshop in some capabilities, one does not replace the other. I find myself often using both applications in the course of digital illustration tasks. And while each of these applications has borrowed aspects of the other over the past few years, there is no expectation that one will overtake the other. More simply put, Painter is the software tool to have if you are looking for a natural media look to your digital art. Maybe I should revise my earlier statement about competition: Painter’s main competition at what it does IS natural media. Constantly I find myself converting artist friends into Painter users. They are amazed at how well the application recreates realistic brush strokes, and furthermore astounded by the ability to mix media on the digital canvas that would be impossible on a real canvas. Plus, there are no irretrievable brushstrokes, and better yet no headaches from chalk dust or mineral spirits. One does notice the lack of the physical sensation of putting brush to canvas, but this fades quickly if you have a good digital tablet to work with. As I said before, Painter 7 is not a revolutionary step forward for the product, but its new features are strong and very useful. At first glance, the interface looks the same as version 6 (unless you are a Mac OS X user, in which case the interface employs the “aqua” look). Closer examination reveals that they have tightened things up a bit and added some enhanced controls. Users can now customize keyboard shortcuts, and tool-sensitive context menus are readily available at the right-click of a mouse (control-click for Mac Users without a 2 button mouse). Overall I find the interface to be well organized and comprehensive for the way I use the application. Painter’s variety of controls offers detailed expression of any given tool. Palettes are now customizable, so valuable screen space is freed up at your demand. I will never complain about having too much control, and that’s exactly what makes Painter worthy of professional artists and designers. Were Painter limited to simple presets, I wouldn’t want to use it. Painter is as flexible as the imagination (at least in terms of 2D art) and more flexible than the natural media it mimics. One major improvement to the interface is the new brush library architecture. It is now easier to organize brushes, create new sets and share variants. Previous versions stored all brushes and variants in a single file. XML makes it possible to alter, move, and share this information at an individual variant level. Don’t worry if you are upgrading from a previous version and want to use your personal settings for brushes-importing a brush library from a previous version automatically upgrades it to the new standard without losing your settings. Painter 7 also offers a couple of handy new tools on the canvas window itself. A scale slider bar on the bottom offers precise and smooth zooming without hassles. The new perspective grid is a godsend for the “dimensionally” challenged, making it much easier to visualize a 3D space while creating images. These non-printing lines are a great help in setting the stage for applying materials, but it is regrettable that you can’t automatically map images or type to the grids. That capability is definitely something to hope for in the future. One of the key components to Painter’s realism is the ability to combine paper textures and patterns with the media being applied for a convincing surface effect. Version 7 offers an important enhancement to this: directional grain shading. This means that applying strokes in a single direction will bring out the texture with partial coverage; using multiple directions will obscure the texture with total coverage. While this is more realistic, I do wish there was a way to turn this feature on and off. The previous versions supplied a much easier way to achieve a uniform texture. With texture in mind, Painter 7 introduces 2 new effects that let the user easily achieve some interesting and commonly-desired graphic results: serigraphy and distress. The serigraphy effect allows the user to break down a continuous tone image into a reduced set of separate color areas. Unlike Photoshop’s posterization-type filters, Painter’s method is totally non-destructive. Each color area is saved to its own spot color layer, and the user may choose as many colors/layers as he desires. Not only is this method more faithful to the actual screen-printing techniques it mimics, but also it allows for more experimentation between the layers past the simple reduction. Distress applies the current paper texture to images, which provides some very intriguing results. If you’ve ever used the Andromeda screens filter in Photoshop, you get some idea of what is possible. Unfortunately, this effect is not as smart as Andromeda’s tool. Applying the effect to an overlying layer will fill the entire layer with the effect. Preserving the layer’s transparency and using the effect will confine the layer to a rectangle surrounding the layer’s strokes/images. The only way to apply the effect to an irregular shape is to painstakingly select the desired area, or erase everything you don’t want on the layer after applying the effect. Hopefully Procreate will fix this in the next update. Another realistic addition to Painter is “liquid ink,” which mimics the glue-like consistency of thick ink. Similar to watercolors, liquid ink strokes occupy special layers. These layers can be visible and display painted-in ink areas, or be invisible and applied to other painting tools to simulate other natural media effects, including scratchboard, enamel, and woodcut. Once again, the strength of the tool lies in its realism. I have been able to achieve graphic effects with it that previously would only be possible with third party plug-ins in Photoshop. 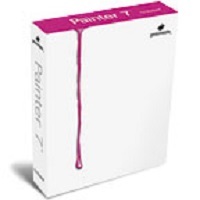 Speaking of Photoshop, Painter 7 continues to make improvements in compatibility between the two applications. Painter can open PSD files with layers intact, although it doesn’t recognize Photoshop 6’s layer sets, and any styles, type or vector shapes must be rasterized in order to be visible in Painter. Painter can also save a file as a PSD document, but will lose the integrity of its liquid ink and watercolor layers if opened again in Painter. The only way to retain editability of many of Painter’s proprietary features is to save in its native RIFF format. It would be nice if the interplay between the two was more seamless, but that’s an improvement I’m willing to wait for. Although improved for version 7, the text tool still needs work. Perplexingly, the font pull-down list is limited to 5 fonts, and past that you must access a clunky dialog box to choose other fonts from your full active set. Controls for tracking, leading, and alignment are adequate, and the shadow option is a nice touch. But the “curve style” controls make no sense and offer little real usefulness. You can only choose from a few very similar presets here, and can’t alter the curves at all. It’s as if Procreate stopped working on this feature halfway through and forgot about it. If you have any type needs past the very mundane, it’s best to leave that task to an application like Photoshop or Illustrator. Painter’s new enhancements for web designers are few but useful. You can now create color sets from an image, layer, or selection in one step using the “color set” tool in the art materials palette; previously one had to use the eyedropper tool for each color desired in the set. Painter 7 also includes a live preview in the JPEG and GIF export dialogs, which are a step up from previous capabilities. Still, if you want selective image compression, slicing, or precise GIF output controls, you will have to look elsewhere. Although Painter 7 is a modest upgrade, it is a huge relief to see it going in the right direction under the guidance of new ownership. Some big improvements have been made, and thankfully nothing crucial has been stripped out. It seems clear that there is a commitment to making this fantastic tool even better in the future. While there are some legitimate gripes about some usability issues, the simple fact is that Painter wonderfully does many things that no other software tool can. With each version, Painter becomes easier to use and remains a high-end professional solution for artists and designers that crave realism and miss working with natural media. If you are considering purchasing Painter, be aware that the application demands a lot of hard drive space and RAM. The current version and its accompanying extra materials (patterns, textures, brushes, etc.) come on two CD ROMS. I also highly suggest purchasing a large pressure-sensitive digital drawing tablet (like a Wacom), as this will best translate Painter’s natural media techniques. You can do some interesting things with a mouse, but will not fully realize the power of Painter without being able to “draw” as you would with natural media. I personally use a 12×18 tablet with 200-300 mb of RAM allocated to Painter and have been very happy with the results.